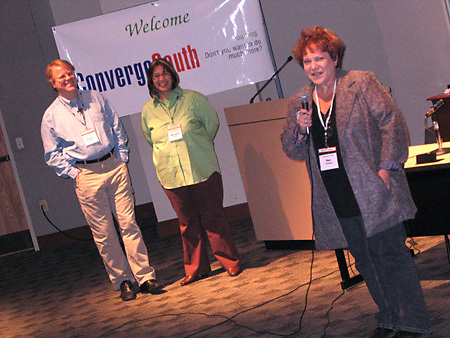 This year’s ConvergeSouth wrapped up yesterday. It was a great conference once again. The barbecue Friday night at David Hoggard’s was delicious. On Saturday, the conference itself started off with Elizabeth Edwards, who laid to rest any fears that her talk would be politically partisan by barely mentioning anything even remotely partisan. She even shared the stage for part of the discussion with Mike Krempasky of RedState.com. Between sessions I ate lunch with David Boyd, Fecund Stench and Gail Dunham. After lunch, I attended Mr. Sun’s session entitled “The Big Bang”. He outlined and explored options for dealing with online trollery and disruptive behavior. One point that came out of the discussion is that it doesn’t matter what your strategy is for dealing with disruptive behavior, the important thing is that you do come up with a strategy of some sort, make it known, and implement it. Strategies will differ between blogs depending on the disposition of the person running the blog, and the purpose of the blog, and that’s ok. Finally, Ed Cone made some closing remarks, including mention of an impromptu after-conference talk about the “confidential” RMA report, which now seems to be on everyone’s fall reading list. That evening I attended one of the dinners at Ganache. After we finally figured out how to arrange the tables so we could fit everyone in, I was pleased to be able to talk with some folks from Philly – Wendy Warren of The Philadelphia Daily News, and Dan Rubin, who writes the blog blinq for The Philadelphia Inquirer. I also got to meet and speak with Jim Buie, WillR, Bora Zivkovic, Zack and Elizabeth Exley, Austin Chandler, Kirk Ross, Cara Michele, and Ed Cone and his wife Lisa Scheer. This was supposed to be the off-year – a smaller, more low-key version of the conference. 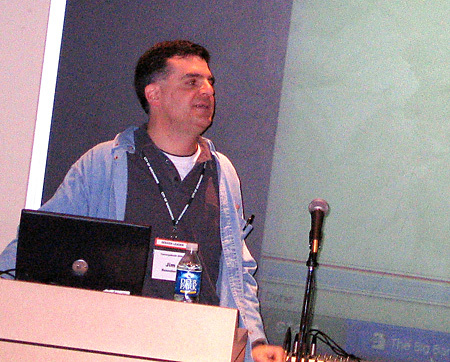 Given that there were over 200 people attending, it’ll be interesting to see how large ConvergeSouth 2007 becomes. This entry was posted on Sunday, October 15th, 2006 at 2:07 pm	and is filed under Blogging, Greensboro, Local, Technology. You can follow any responses to this entry through the RSS 2.0 feed. Both comments and pings are currently closed. You forgot to mention you attended the live music event. Me! Me! A picture of me! Wow. Can I have a high-res, please? One of the great things about events like CS is meeting the folks whose content you read daily. I’m not sure how I originally acquired your RSS feed but it was more than a year ago. Nice meeting you “in the flesh” and agree – next year’s CS is already on my todo list. Heh… I was actually trying to get to that, but I had to cut the post short so I could go do some non-blogging duties around the house. So, yeah – dropped by the Flying Anvil for some music, said hi to Robert, Maryam, you, Sue, Michele, Sean, Angela, Shaka, and Jay (did I miss anyone?) and then left because we didn’t want to make the babysitter watch our kids all night. Sue: Of course – I’ll email you a high res version.